Thanks to all who participated in our shoot-out! Last week, I posted three recordings of a weak shortwave broadcast in an attempt to evaluate which recording–thus which radio–our listeners prefer. The test was “blind” in that, though four radios were evaluated, only three recordings were posted, merely labeled, “Sample #1,” “Sample #2,” and “Sample #3,” respectively. The radios tested were not just average radios. 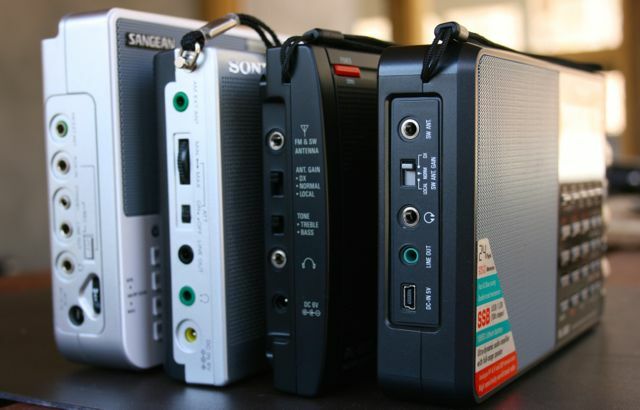 Rather, they represent the best of the truly portable radios currently on the market, namely: the Sangean ATS-909X, the Tecsun PL-880, the Tecsun-PL660 and the Sony ICF-SW7600GR. To refresh your memory, I’ve embedded the audio samples below–but if you haven’t yet, I would encourage you to read our previous post (and the great reader comments following!) before proceeding. The recordings in our samples are of Radio Romania International on 11,975 kHz. Normally, the signal would have been stronger, but propagation was rough, and QSB (fading) was pronounced at times. Note that I recorded all of these samples with my Zoom H2N digital recorder via a line-in connection, using the radio’s headphone jack. Since not all of the radios have a line-out jack, I used the headphone jack each time and simply set the volume and line-in gain to the same level. 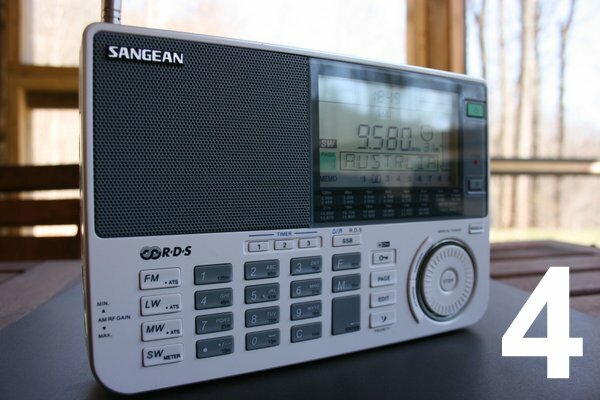 Many readers guessed rightly that the Sangean ATS-909X was the radio omitted. Evidently, it is known for its lack of sensitivity when only employing its telescoping whip antenna. You’ll notice that, most of the time, the RRI broadcast is lost in the static. Frankly, I was somewhat surprised that the ATS-909X didn’t perform better. It has a loyal following amongst SWLing Post readers and has been a popular radio on the market for the past three years or so. While I’ve used the ATS-909X in the past, I have never owned one, and had never done a side-by-side comparison. To perform this test, I borrowed the 909X from a friend who usually has it hooked up to an external antenna. In fact, this is when I learned that the 909X performs admirably when hooked up to an external antenna. In my tests, however, I didn’t want to hook up external antennas. I believe that for a radio to be evaluated as a portable, it must be judged on its ability to receive signals from its telescopic whip antenna as a base line. 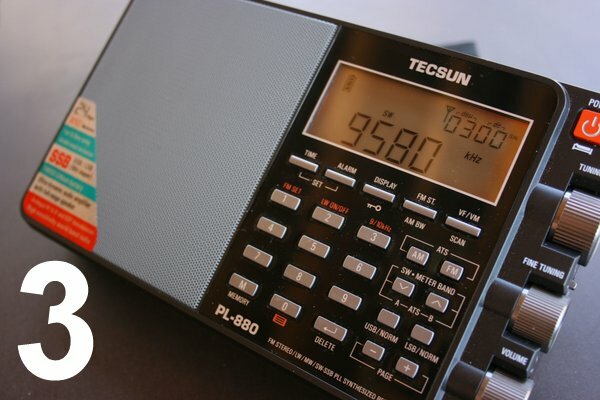 With the exception of three votes (out of more than seventy), Sample #3–the Tecsun PL-880–was overwhelmingly voted worst in this weak-signal shoot-out. The bulk of your criticisms focused on the fact that the PL-880 did not handle fading as well as the other radios. When the signal was at a peak, it sounded great, but in QSB troughs, the signal became unintelligible and you could hear DSP artifacts and distortion. 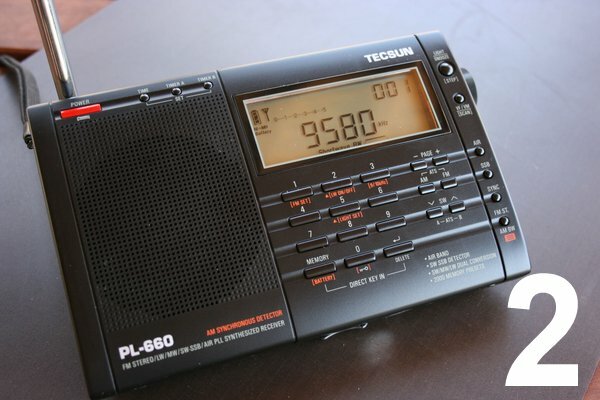 During the first day of voting, the Tecsun PL-660 actually had a noticeable lead on the other radios. I’m not surprised. The sensitivity was better than the rest of the contestants, in my opinion. The received audio was clear and seemed to pop out of the static better than the others. Overwhelmingly, those who didn’t vote the PL-660 as best, voted it as second. Their main criticism was that the PL-660’s AGC was a little too active and less stable than the radio which actually took first place. After I evaluated the blind test myself, I was certain the PL-660 would be the winner with its stronger sensitivity. But the result–and reader comments–proved me wrong. More of you placed a value on the Sony’s rock-solid AGC circuit which handles the peaks and troughs of fading better than the other contenders. Commenters noted that the Sony’s audio and stability lent itself to easier, less fatiguing, listening. Keep in mind, though, that many of these same commenters mentioned that the PL-660 (Sample #2) would be their preference for identifying a station in under weak signal conditions. Now let’s look at the raw data, and then discuss what it all means. I’ve attempted to place this data into a bar graph to make it a little easier to visualize: If you noticed that these numbers don’t completely add up, it’s because responses were inconsistent. 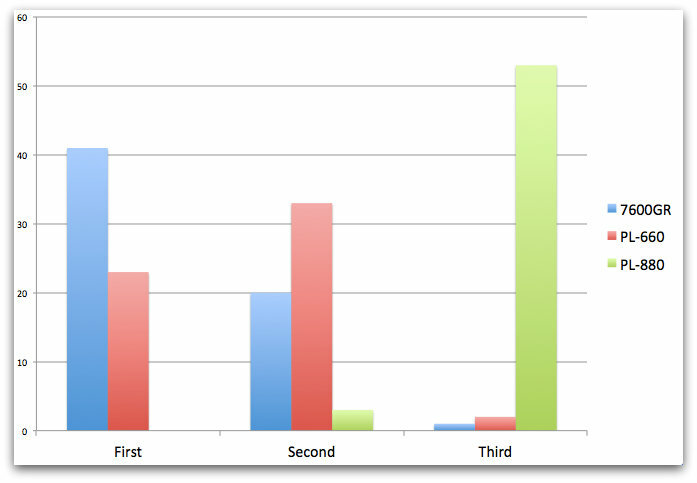 Most survey participants listed their preferences in order (i.e., first, second, and third place). Some respondents only listed their favorite of the three, while others only listed the one they didn’t like. No one responded with a tie between the radios, all had an opinion. Radio Flynn also pointed out that next time I do this sort of test (and I will be doing another!) that I should keep votes consistent by asking everyone to rank their preference. Excellent suggestion; I’ll be sure to do so. 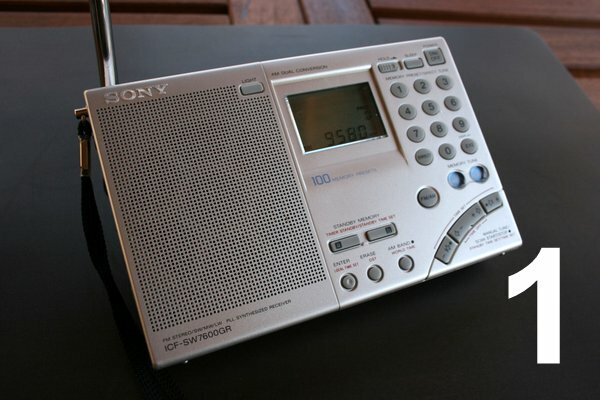 So the Sony ICF-SW7600GR is the best radio…right? Herein lies the difficulty of suggesting the “best” radio for any particular listener. This test only evaluated weak signal sensitivity under rather rough conditions. The Sony was “the winner” in this respect. But this doesn’t tell the whole story. But frankly, when I travel, I reach for the PL-660 more often than not. Why? Yes, the Sony has great receiver characteristics, but its ergonomics leave a lot to be desired. I use my Sony when I plan to key in a frequency and leave it there. The PL-660 is a joy to operate, has simple direct-frequency entry, an excellent auto-tune feature, not to mention, a stable sync detector. If I want to identify a signal buried in the static, I reach for the PL-660. 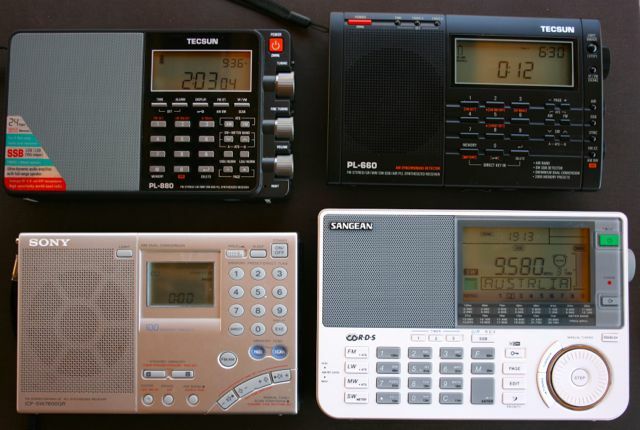 If I want to do casual listening and am less concerned with DXing, I reach for the PL-880. It’s a solid radio and has a quality feel to it (running neck-and-neck with the ATS-909X in this respect). Of this bunch, it has by far, the best audio from its internal speaker. If I want armchair listening, I reach for the PL-880. It’s also an excellent SSB receiver–one of the best in this group–and offers more filter selections. In summary, it’s not always easy to suggest which radio is best…I must ask in response, “Best for what?” The data from this test proves this, as our readers who ranked their favorites backed up their choices with consistent and valid comments. Before long, I plan to pit these radios (and perhaps another?) against each other in terms of their synchronous detectors in another blind test. It may take a while to work this up. Your enthusiastic responses, however, completely justify it. This entry was posted in Manufacturers, News, Radios, Retailers, Reviews, Shortwave Radio, Specials, Travel and tagged Comparing Radios, Most sensitive Shortwave Radio, Radio Comparison, Radio Reviews, Reviews, Sangean ATS-909X, Shortwave Radio Shoot out, Sony ICF-SW7600GR, Tecsun PL-660, Tecsun PL-880 on April 22, 2014 by Thomas.